One of the ADVANCED SERIES of kits, which include factory pre-slotted airframe and through-the-wall fin construction, the HYPERLOC 1600 is an electronic "Multi Stage Deployment" kit with a 75mm HYBRID READY motor mount. the HYPERLOC 1600 was designed specifically for the HyperTek 1600cc L motor but will accept a number of different hybrid and standard composite motors. We included our popular EB-5.38 electronics bay, and additional Tubular Nylon shock cord and an 18" drogue parachute. We also upgraded the elastic shock cord to 25' of 9/16" tubular nylon and added a CEC-3 chain connectors to the SCMBA-375 shock cord mount for heavy duty flying. 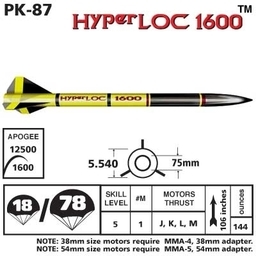 This rocket is for the serious high power flyer! Parachute Recovery.